Keeping an organized and clean fridge is a challenge, there are items that need careful packing and consuming before they go out of date. Whilst all this is happening you need to keep the fridge clean, because of the low temperature and potentially growing and harbouring mould and bacteria increases and it is important for your family’s health that you ensure this appliance is kept clean. Keeping it organized too, preventing items decaying saves you time and money. There are different things that you can do which will help you keep your fridge clean and organized. The more you think about what is in your fridge and taking care of it daily can help to keep an organized and clean fridge without much thought, it becomes a habit! Keeping your fridge clean, sometimes it can seem like a challenge, do you empty the whole fridge or just clean the bits you can see. My approach to this it ensure that everything that goes into the fridge is clean. I then do spot checks on the fridge daily to see if there are areas that need some attention. I prefer to do a deep clean when it is empty, this means there is less to move and cleaning is fairly straight forward. Don’t forget to check for damage and signs of wear and tear as you clean. Organization in your fridge isn’t difficult. Knowing where items belong is important, and grouping items into categories are one way to keep your fridge organized. You can try containers in your fridge to separate different areas, but not everyone likes this idea, you might find it more annoying than just being able to put things on the shelves. Knowing the correct places to store your food helps and getting in the habit of putting the items back where they came from is great training for keeping your fridge organized. You can try having labels for the different areas to help other family members learn where to put the items and where to find the things they want too. Using up the food that you have is important; the best way to do this is to know what is in the fridge and what you need to cook or use for meals to ensure you are not wasting food because you forgot to look. How you do this depends on how you like to organize, you could meal plan and choose meals that use up the ingredients you already have or you can create a list of the open products and their use-by dates. I have even seen one in a spreadsheet format that tracks the food and the expiry dates which is awesome! How you store your food in the fridge is just as important as the organization and the cleanness of your fridge. You need to ensure that you have the right storage for the different types of items you store in the fridge and the temperature of the item before you put it in the fridge. Don’t have raw meat open on a plate, this can potentially spread bacteria which can have an effect on your health. Make sure you use an appropriate cover for your food items, this protects them from contamination from other items. Food that is too hot going into your fridge raises the temperature of your fridge and can lead to other foods spoiling and going off. Knowing the items that you have in your fridge is important and not having more food than you can consume. This is a waste of money if your fridge is too full and you have to throw away food because it goes off before you consume it. Don’t buy things just because it is on offer or you might want to eat it, always have a plan for the food you have, it makes better financial sense too. I don’t have the perfect fridge, I have to work on this one too, my main problem is the height of the top shelf and how tall I am, I can’t reach this shelf easily and this causes me stress as other family members choose to hide objects up here! I am working on a plan to stop this! 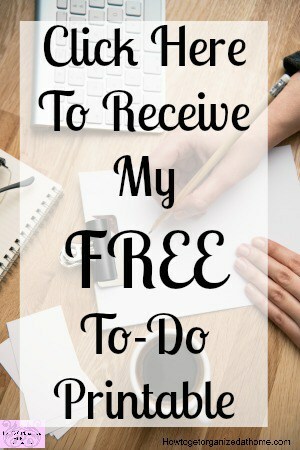 I take each day as they come, some are better than others and I just practice at getting the tasks I need to do sorted and that includes making sure my fridge is clean and organized. I think the most important thing to learn is not to panic, one step at a time will result in an organized and clean fridge, don’t expect miracles and for things to happen, you have to work at keeping your fridge clean and organized, the same as the rest of your home. Reading up on the manufacturer’s guidelines is a great idea if you want to understand the recommendations and the best placement of food in your fridge. You might find helpful cleaning tips too! Therefore, an organized and clean fridge is the most ideal, but taking it one step at a time is vital for the important habits to form and for the organization and cleaning to become a part of your routines and cleaning habits. What are your best tips for an organized and clean fridge? Comment below! Looking for more articles on this topic? Head over to the landing page where you will find links to other articles on organizing. I wrote this article I think you will enjoy it! 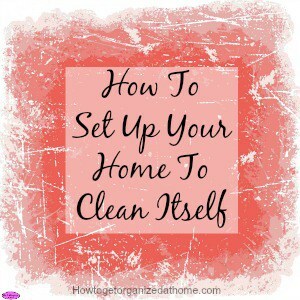 How To Set Up Your Home To Clean Itself.